Natural Teak roots on top of a round clear acrylic base. 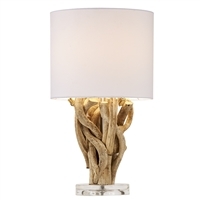 Natural Bleached Teak roots on top of a round clear acrylic base. 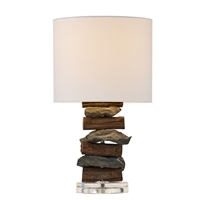 This Stone and Teak table lamp adds beauty and natural element to any room. 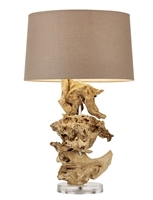 This lamp is made of Sleek,Solid Teak, with a jute linen shade to complete it. Simple, yet eye catching all at the same time. 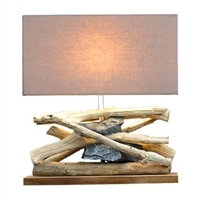 Perfect for any room in a house or office! 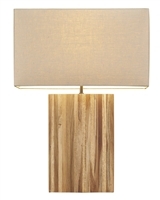 whole lamp 5.5" x 5.5" x 28"
This lamp is made of Sleek, Solid Teak, accompanied by a Jute linen shade to complete it. 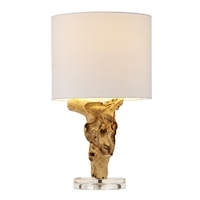 Smooth and simple, this lamp is perfect for any room in your home or office. 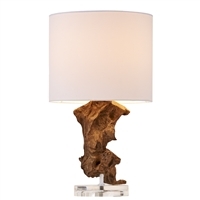 The base of this elegant lamp is made of standalone old teak root pieces that are naturally statue like shaped and line up by Scandinavian designers to give it the amazing look of element. 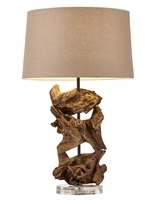 The base of this elegant lamp is made of stand alone old teak root pieces that are naturally statue like shaped and line up by Scandinavian designers to give it the amazing look of element.